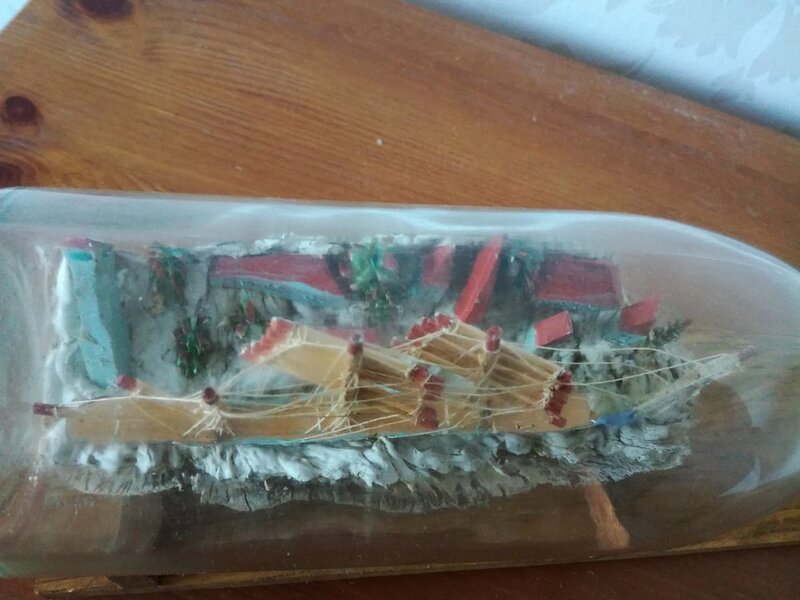 So I received an email regarding an old ship in bottle that some one had. They wanted more information and possible value. Some how that email disappeared before I could respond to it so I thought I'd post something real quick. If you emailed through the contact us email please email again I'd like to answer your questions. As far as valuation goes it starts with authenticating the bottle. Looking at the bottle and finding clues on how it was made which can help determine when it was made. If a bottle was made using a method from the 1950's it can be determined that the ship in bottle is no older than the 1950's. If the bottle was made using methods from the late 1800's then it could have been built anytime after that. So the bottle is a great way to start. Materials and objects in the bottle can also help. 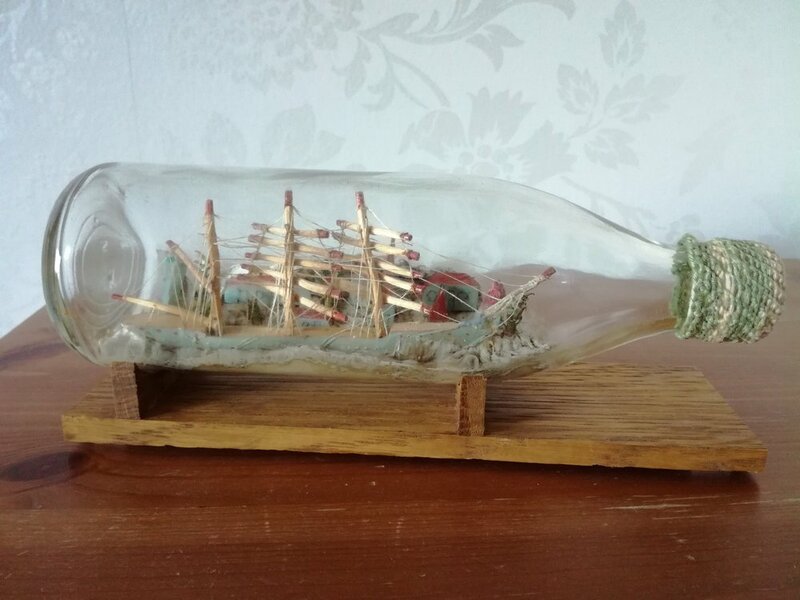 I have found that most ships in bottles prior to around 1920ish don't have sails on them. This is not a hard fast rule but as I have delved into older ships in bottles it seems more and more had sails the later they were built. This is possibly the way that ship in bottle methods were passed on. I don't know for sure. All I can say is theres enough evidence to say if the bottle a ship is in was built between 1900 and 1930 and it doesn't have sails there is a strong possibility that the ship was put in before 1920. It's still a guess but an educated one. As far as valuation goes ships in bottles are unfortunately not work a whole lot. As far as antique markets are concerned they are trinkets and folk art. At most a 100 year old ship in bottle is probably worth $300. If it has a great story that could be authenticated it might be pushed to $400....maybe. It's a big maybe. Most I've seen sell for $100 to $250. 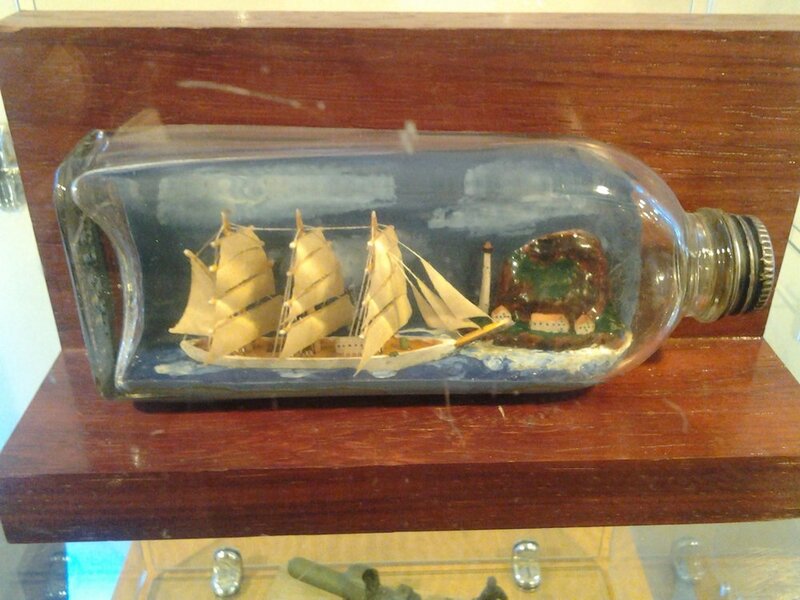 If any one has old ships in bottles that they'd like more info on please post pictures and share it. Our membership loves digging into the details and often small seemingly insignificant parts can tell a big story. For instance the ship in bottle in the header of this website portrays Devin England and has a windmill. That windmill blew down in 1919. So I can reasonably say the ship in bottle was likely built before then because the builder knew the windmill was there. It also points to the builder's knowledge of Devon England. The lack of sails also points to being built earlier in the 1900's. These little details can tell a lot about a ship and the builder. So post your old ships in bottles. We'd love to tell you about them. 1) Early to Mid-20th Century European Style: Most of these are dioramas with village and seaside scenes. There are very detailed. Also, some European artists painted the inside of the bottle with sky and clouds. Often these were painted with an egg-base medium which will flake over time & UV exposure. 2) Prisoner of War bottles: Axis power prisoners camped in England, Canada, and the US often made bottled art for luxury items exchange. These pieces were often done in the European style mentioned above. The bottles used were mainly corked so no screw top threading. Often the artist would inscribe them...where they were, and who they were. If it is documented, the POW bottles are very valuable...have seen a few ranging from $600 - $1000. 3) String work and rope work: This enhances the piece/value. The header bottle is a great example of a macramé weave graced with a turk's knot. Some string work, like the coach whip handle weave, is very time consuming ( personal testimony), though the chevron pattern looks great on the neck. The cord can also be used to date the piece. Polyester came into main use during the mid 1940's. 4) Right handed verses left-handed artists: ( "He has a sinister hand"...Shakespeare's Romeo & Juliet ). Right-handed artist will have the vessel sailing to the bottle neck to the right. For left-handed artists, it is to the left. I have encounter a few pieces that were made by a left-handed artists. It is open to debate it the value of a left-handed artist is more/equal to a right-handed person. Though in appraising a bottle, it should be noted. 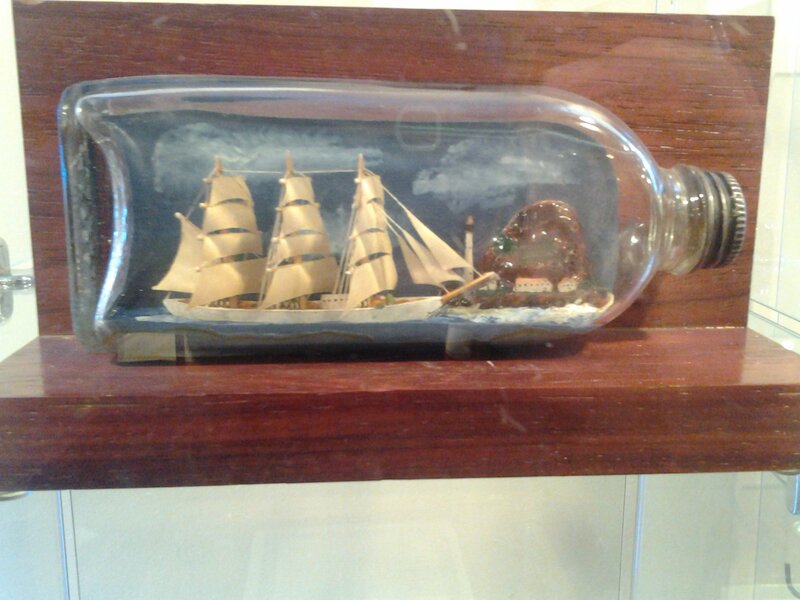 I met someone a while ago that had this ship in bottle. He said the previous owner claimed it was made by a prisoner of war in Canada. It does have the screw top though. Yeah it is one of those rules like I have for dating ships based on sails. Most I've seen Prior to 1915ish don't have sails. It doesn't mean they wouldn't but it makes good general rule. SIBs like the Giovani Biondo models are a good example of an exception to my sail observation. Those sibs are an exception in and of themselves though. I need to look more into the bone models. Other than being made by POWs I don't know their history. I've seen some exquisite examples and it made me wonder how pows would have had access to the tools required. 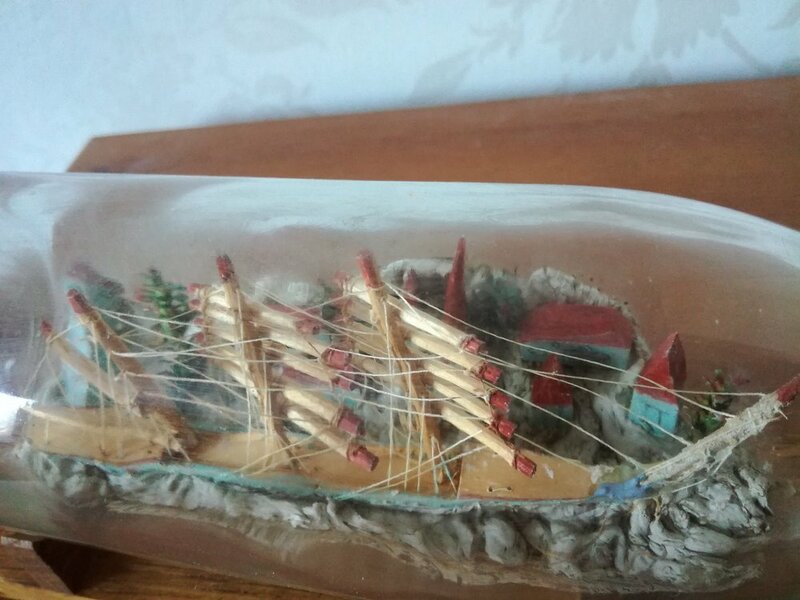 I was given this ship in a bottle by a friend. 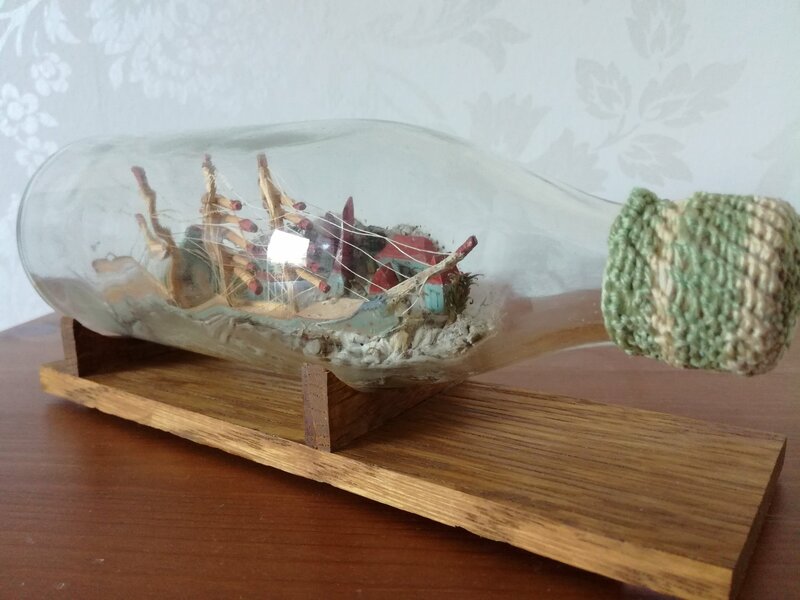 The bowsprit was broken and needed repairing and the bottle was very dirty inside and needed a clean up.There was no cork in the end of the bottle,only a colourful knitted cover so I imagine over the decades dirt had been building up inside. Age wise ;not really sure because those type of bottles have been around a long time in Finland but I'm guessing early 1940's to maybe late 50's. I am particularly impressed by the landscape behind the ship. I think that it is a very pleasing model. PS.I just placed it on a spare stand I had laying about. Thanks for sharing this. I do like the knot work. Repairing ships in bottles seems like a tough job particularly if you leave the ship in the bottle. Great work getting her sailing again.